Here are our Top 10 Teaching Writing Resolutions for you this year. Try one or try them all. Share with us on Social Media and let us know how they’re going! Keep your conferencing binder up to date with rubrics and resources for the current unit. Present only one or two teaching points when you conference. Have your students write every day. Find time for your students to share their writing. Help your students avoid using text-like slang in their writing. Encourage your students to expand their vocabulary. Meet with other teachers at your grade level and score some writing pieces together. This will spark great dialogue and will help make sure that scoring is consistent across your grade level. 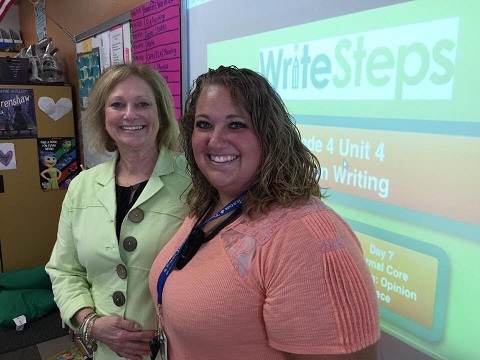 Sammy Niehaus, a 4th Grade Teacher at East Jackson Elementary, was one of the first eWriteSteps teachers to dive into CaptivationStation. She says, “Now, there’s no turning back!” Read on to see what she loves about eWriteSteps and CaptivationStation! WriteSteps: How long have you been using WriteSteps? Sammy: I was first introduced to WriteSteps as a student teacher in 2012. It was new at the school, so I was learning alongside the teacher. I started learning with Joanna Van Raden who was teaching down the hall, and was blending her writing lessons with videos! Last school year, my classroom was given the opportunity to pilot CaptivationStation videos, and they LOVED it. This year, we are using CaptivationStation in my classroom, and I never want to go back to any other writing program again! Sammy: My favorite thing about WriteSteps is that it is effective and engaging. I also don’t have to spend nearly as much time preparing lessons, because they are done for me. It is easy to use WriteSteps in my 1:1 classroom, and I feel like a better writing teacher because of the program. Anytime I have questions, I can usually answer them myself, or the WriteSteps team is always quick to answer me and provide support. Sammy: Dive right in! Don’t be afraid. At first, I was a little overwhelmed because there was SO much to look at and decide from. But as soon as I made the decision to just do it, and go all in, my students became better writers, and I became a better teacher. We evolve together on a daily basis. Sammy: My students are excited about writing. We write more this year than I ever have in the past. They want to write during their free time, and share their writing, comment on each other’s writing, and find new things to write about every day! My students are engaged so much more, and are able to follow along and actually learn the writing process. I truly believe that my students are “getting it” this year thanks to the help of WriteSteps. Sammy: I will never forget the day when one of my learning disabled students, who is also emotionally impaired, said to me that using CaptivationStation was the best thing he had ever done. He told me about how he hated writing, because he never felt smart enough to write, but when he was able to write online and have people comment on his writing and tell him he was doing something good, it made him feel like a person that mattered. At the beginning of the year, he would refuse to even write a sentence, but by the end of the year, he was writing stories about the things that he loved most. Sammy: Write with your students. Share your writing. Students love to see how your brain works, how your sentences flow, and they are so much more engaged when they see you working alongside them. WriteSteps will be celebrating Digital Learning Day on February 23, 2017. Look for more details in the February newsletter! We will share some of our favorite digital learning tools. If you have some you’d like to share, email [email protected]! Check out our newest blogger, Blended Learning Specialist, Joanna Van Raden, at Write with Joanna! Joanna continuously updates her blog with great tips about ways to incorporate technology into your classroom especially with regard to the “Blended Writer’s Workshop!” You can also follow her on twitter at @joannavrteaches.